Spiders can dance on water like tiny ballerinas pirouetting across a slippery stage. But unlike a ballet, this arachnid dance routine isn't just for show, a new study finds. Researchers discovered that spider dancing (also known as spider sailing) is a part of the "ballooning" process -- a popular method of transportation for many species of spiders. When ballooning, spiders typically climb to the top of a plant, stick their spinnakers into the air and shoot out a long strand of silk, which catches a breeze and hoists the silk (and the spider) into the air. "We thought that if terrestrial spiders landed on water it was very unlikely that they'd be able to balloon [again], and they'd all die," Hayashi told Live Science. "But now we have to change that idea, because they actually can disperse across the water." To find out more about how the spiders stay afloat, Hayashi and his team examined 325 adult spiders belonging to 21 different species. All of the spiders had "water-resistant legs" that allowed them to get wet without sinking below the watery surface. While each species had its own signature dance routine, the researchers found that all species tended to use a series of six different postures to stay afloat and move across the surface of the water. One of these postures was "sailing," in which the spider reacted to a gust of (artificial) wind by raising its legs up like sails. 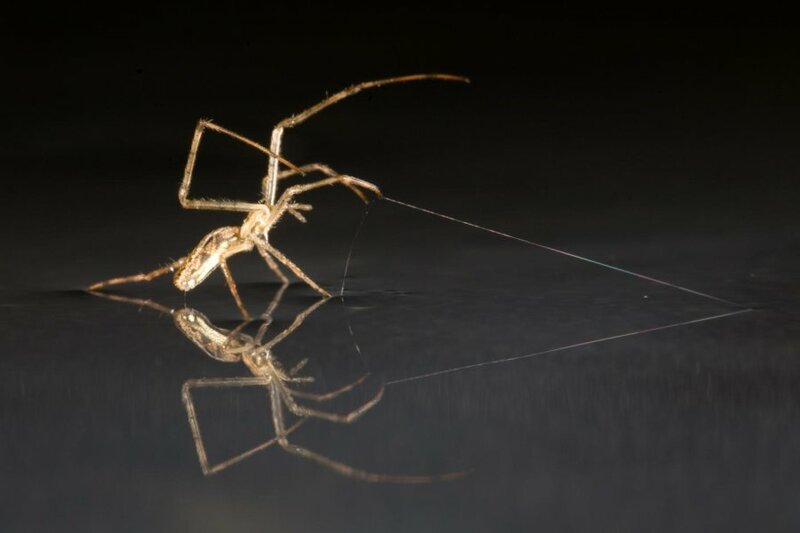 Sailing spiders were able to slide over the water without creating any turbulence, the researchers found. "The movement is very smooth. It's almost like they're skating on the water," Hayashi said. Other spiders take a different approach to sailing, raising their abdomens into the air like sails. This pose makes it look as though the sea-worthy spider is doing a handstand on top of the water, Hayashi said. These postures, and several others, help stranded spiders stay alive, the researchers said. And that's a very good thing, not just for the spider, but for the entire ecosystem that the spider inhabits, according to Hayashi, who said that many of the species that exhibit these water-dancing behaviors play an important role as predators in their respective environments. This predatory role becomes even more essential when a spider is one of the first creatures to inhabit an environment (for instance, a newly burned forest or the land surrounding a recently erupted volcano). "Spiders are the first colonizers among animals coming to a new or newly created habitat. They come very quickly and become the top predators," said Hayashi, who explained that such predators are needed to control the populations of insects that also typically colonize such habitats. The study explains how spiders have been able to colonize such places, even when it means crossing a body of water, according to Todd Blackledge, abiology professor at the University of Akron in Ohio, who was not involved in the study. "Their insights are a nice example of how keen observation of natural history combines with science to [help us] learn about the natural world," Blackledge told Live Science in an email. "There is still a huge element of risk and randomness involved but these behaviors provide spiders with much better control over their dispersal than we knew about before." Blackledge also said that he has observed spiders propelling themselves across the water over "quite long distances." However, it isn't yet clear just how long a spider can keep sailing over a body of water, said Hayashi, who noted that he and his team are trying to answer that question now. The researchers are also exploring whether or not sailing spiders are affected by the saltiness of the water. If they're not bothered by salt water, then it's possible that these remarkable arachnids could quite literally sail the high seas.